There are two races in the FIM CEV Repsol Moto3™ Junior World Championship season finale at the Circuit Ricardo Tormo, and the Junior Talent Team will be attacking from the front after another impressive qualifying performance, set up well for Sunday. After rain affected the Grand Prix and the test thereafter, the skies were finally sunnier for the CEV and the JTT made the most of it. Yuki Kunii heads the charge from his first pole of the year, with fellow JTT rider Ai Ogura also on the front row, taking P3. Kunii's fastest lap was a 01:39.027 to put him over two tenths fastest on Saturday, with Ogura in P3 half a second off and the pair split by Makar Yurchenko. That bodes well for the JTT duo on Sunday as they aim to replicate their top five and podium pace of the FIM CEV Repsol's first visit to Valencia this season. They're also aiming to end the season with gains in the overall standings. Tom Booth-Amos, meanwhile, had a tough first visit to the Circuit Ricardo Tormo earlier this year and was sidelined by injury. Now he's back on track for the British Talent Team and after a top five result in Albacete, lines up on Row 8 for the season finale - looking to move forward and score more points now he's back up to full fitness. 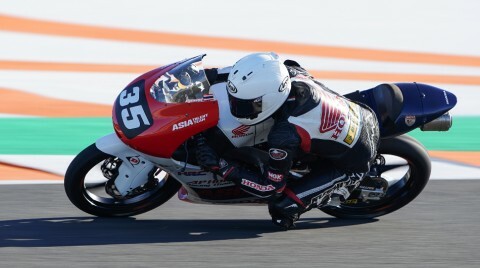 Gerry Salim starts a little further back on Row 10 after a tightly-packed qualifying, looking to follow up his first point of the season with more, and newcomer Tachakorn Buasri - an alumnus of the Asia Talent Cup - qualified on the penultimate row of the grid. That's no mean feat on his debut in the Championship, and he'll be looking to learn as much as he can and get a solid two races' worth of laps under his belt on Sunday, fresh from his first podiums in the ATC. That’s a wrap from Saturday and now it's time to gear up for the last race day of the season, so make sure to watch the Junior Talent Team race for the last time in 2018 when the lights go out for the Moto3™ Junior World Championship races at 11:00 local time (GMT +1) and 14:00 on Sunday.